Recently Microsoft took down their popular Silverlight.net web site. At first the URL was redirected to MSDN and then the underlying content was removed breaking all the backlinks to the site. When all the backlinks broke we saw a resurgence of the “What’s the future of Silverlight” and “Silverlight is Dead” content in the blogosphere. Mary Jo Foley wrote “Microsoft pulls the plug on its Silverlight.net site” and Tim Anderson wrote “Microsoft Silverlight: shattered into a million broken URLs”. There is no official word about the future of Silverlight from Microsoft but the level of activity around Silverlight has definitely decreased. One of the indicators of the level of activity around Silverlight can be observed with the product’s End-of-Life commitments. If you check on the Microsoft Silverlight Lifecycle page, you will see that all versions between Silverlight 2 and Silverlight 4 had mainstream support for 2-3 years. However, Silverlight 5 which was released quietly in 2011 has its end of life 10 years later in 2021. So the good news is that Silverlight 5 will be supported for a while so any investments in this should be relevant for the lifetime of most apps. However, the bad news is that judging from previous end-of-life commitments on earlier versions, it doesn’t look like a new version of Silverlight is in the works any time soon. In addition, the popular MIX conference where many of the new Silverlight features were unveiled was cancelled in 2012. So how does that translate to what we are seeing in our web hosting services? We conduct many surveys and we ask our customers what kind of technologies they use for their web presence. In the earlier days of Silverlight, due to the excitement, rapid release cadence and customer interest, we published research papers about the State of Silverlight adoption and we also reported on seeing Silverlight overtaking Flash among our customer base web sites. We also released a Silverlight Control Panel Starter Kit as starting point for those that wanted to build custom solutions that interacts with our control panel. 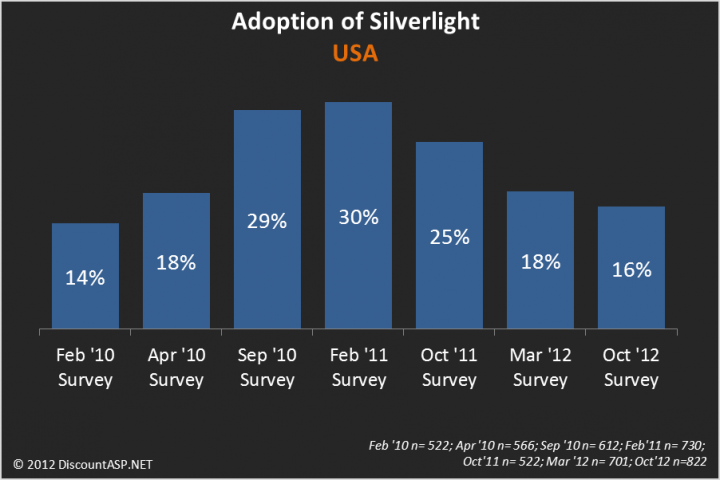 Gathering our survey results form February 2010 to October 2012 – from a total of 7 surveys, we see a bell-curve rise and fall of Silverlight adoption over time. At it’s highest point 30% of our customers were using Silverlight in February 2011. Today we are seeing similar adoption levels as back in February 2010 – back in the Silverlight 3 days. In order to gain technology adoption, the results show that the vendor really needs to keep pushing forward with new releases and must keep the conversation and excitement alive. It was the end of October 2010 when it was reported that Microsoft’s Silverlight strategy had shifted which upset many Silverlight developers. Within a year of the strategy shift announcement we start to see the Silverlight adoption levels start to decrease. We’ll keep an eye out on technology adoption trends among our customers and will let you know if we see anything interesting. Follow @takeshiDASPVisit DiscountASP.NET to learn more about our ASP.NET hosting services.